A man accused of plotting to kill police and who they believe was “recruited” into the IRA was granted bail today (Friday, March 23). A prosecuting lawyer told the judge, however, the PPS will be exercising their right to appeal his decision to the High Court with a hearing within 48 hours. O’Neill, a one time trainee teacher from Silverwood Green in Lurgan, is in custody charged with possessing an improvised explosive device with intent to endanger life and attempting to murder police officers on a date unknown between 30 August and 2 September, 2016. He has been in custody since his initial remand and today defence solicitor Niall Murphy said it was accepted on all sides that even “with a fair wind behind us, there will not be a trial his calendar year”. O’Neill was arrested alongside three other men after police discovered a fully improvised explosive device during raids in Lurgan. Previous courts have heard how police received information that a rucksack had been moved from the site of a former factory in Lurgan and that triggered a police surveillance operation on what detectives claim is “an active service unit of the IRA”. The charges against O’Neill have been severed from his former co-accused who are 47-year-old Damien Duffy, from Westclare Court in Dungannon and who is a brother of prominent republican Colin Duffy and Lurgan men Ciaran Magee, 24, from Lake Street and Shea Reynolds, 22, from the Kilwilkie Road, all of whom have been granted bail. The three are jointly accused of the preparation of terrorist acts, namely targeting a former member of the security forces, in September 2016. In court today a Detective Sergeant said police still had objections to O’Neill being granted bail amid fears that he would reoffend or would “utilise a support network” to abscond. 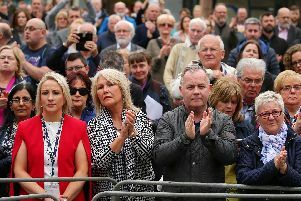 He said it was the police view that O’Neill was “easily manipulated” when he was allegedly “recruited into the IRA” so there was a concern that he could be pressurised by others to involve himself in further dissident republican activities. Mr Murphy, from KRW Law, highlighted that his former co-accused has all been freed on bail despite the same police objections. He told Judge Perry they had all been freed on the basis of “concerns about delay” in the case being progressed so for all four, “the balance had been tipped” in favour of bail. Judge Perry said he would grant bail, asking O’Neill to stand so he could outline the numerous bail conditions. Despite being asked twice by the judge, O’Neill refused to stand. The judge said he was freeing O’Neill on his own bail of £900 with a multitude of conditions including reporting to police, stating out of Lurgan, having no contact with his former co-accused, being tagged, must surrender his passport and prohibited from owning or using a mobile phone. Notwithstanding the PPS High Court appeal, O’Neill will appear again on 12 April.